Fracture process of MWCNTs revealed by in-situ tensile tests. (a) CNT acts as bridge curtailing crack growth in the Al matrix. (b, c) CNTs 1, 2, and 3 experiencing different wall fracture processes at different magnifications. Arrows indicate the exposed inner walls. (d) Fractured CNTs on the composite surface after tensile test. Researchers from Japan and China believe they have confirmed the reasons for carbon nanotubes’ remarkable strengthening effect in metal matrix composites [Chen et al., Composites Science & Technology 113 (2015) 1-8, http://dx.doi.org/10.1016/j.compscitech.2015.03.009]. Carbon nanotubes (CNTs), with their high strength, modulus, large aspect ratio, and light weight, seem to be the ideal reinforcement fiber for composites. These strong fibers are particularly attractive for next-generation structural metal matrix composites (MMCs) for the aerospace and automotive industries. To make the most of CNTs, it is vital to understand exactly how they act to reinforce a composite. But although various strengthening mechanisms have been postulated, it is not clear which dominates. Now researchers from Osaka University and Xi’an University of Technology think they have the answer – a phenomenon known as load transfer, in which the applied stress is transferred from the metal matrix onto the reinforcement fiber. 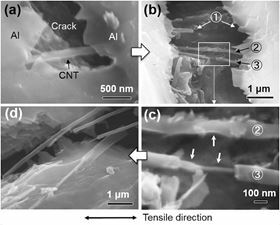 The researchers performed in-situ tensile tests of multi-walled carbon nanotube (MWCNT) reinforced Al matrix composites and observed the fracture behavior using scanning electron microscopy (SEM). According to first author of the study, Biao Chen of Osaka University, the in-situ SEM approach provides a direct and easy method to investigate the mechanical behavior of CNTs in composites. “Compared with commonly used post tensile test observations, [our approach to the] fracture behavior of CNTs is more compelling, direct, and detailed,” Chen told Materials Today. Using a powder metallurgy (PM) route, the team fabricated an Al metal matrix composite reinforced with 0.6 wt.% MWCNTs produced by chemical vapor deposition (CVD). When a force is applied to the composite, the CNTs initially act like a bridge to suppress crack growth. As further force is applied, the outer walls of the nanotubes in contact with the Al matrix start to break. The inner walls then fracture, either breaking vertically or unpeeling to expose the next inner walls, and so on. The completely fractured composite surface shows ruptured CNTs. Load transfer is the most desirable strengthening mechanism because it makes the most of CNTs’ mechanical properties and fits with the shear lag model of fracture behavior. The observations will support progress toward the fabrication of even higher strength CNT/MMC composites, say the researchers.